The annual sales rate of new houses dropped 3.3% in February, dipping to the slowest pace since September, the Commerce Department reported. As a result, the supply of new houses for sale rose to its highest level in more than three years. Also, the median sales price for new houses dropped 1.2% from the year before, which could help lure more buyers into the seasonally strong spring real estate market. Another sign that the long housing recovery may be past its peak came from the S&P/Case-Shiller home price index, which registered lower year-to-year price increases in January for the second month in a row. The 20-city composite index has been relatively flat for five months, having recovered to the pricing level reached just before the 2008 financial collapse. Housing economists with S&P said weather held back price gains in February, and they cited evidence suggesting continued increases in home equity in 2014. Outlooks brightened in March as consumer confidence rose to its highest level since January 2008, according to the Conference Board. Consumers feel better about jobs and the economy but less upbeat about prospects for higher income, the business research group reported. Survey respondents said their assessment of current conditions remained relatively positive. Consumer confidence is considered a key indicator of consumer spending, which accounts for more than 70% of U.S. economic activity. A measure of manufacturing strength, durable goods orders, rose more than analysts expected in February following two months of declines. The Commerce Department said commercial aircraft orders led the rebound, but orders excluding the volatile transportation sector also increased – for the fifth time in six months. Orders for non-military capital goods excluding aircraft fell for the second time in three months, a sign of weaker investments by businesses. Another sign that the housing recovery might have peaked was that pending homes sales declined in February for the eighth month in a row. The National Association of Realtors blamed the latest drop on weather, along with low inventories and diminishing affordability. But the trade group said the residential market is stabilizing with a slight boost in buyer traffic. The Realtors forecast sales of 5 million existing houses for 2014, down from 5.1 million in 2013. Employers continued hanging on to workers, for the most part, as the moving four-week average for initial unemployment claims declined for the fourth week in a row. The Labor Department released data showing the average claims sinking to their lowest mark since September, remaining well below the 47-year average. The U.S. economy grew at a 2.6% annual rate in the last three months of 2013, down from 4.1% in the third quarter but higher than the 2.4% pace previously announced. In its third estimate of fourth-quarter Gross Domestic Product, the Bureau of Economic Analysis said the rate of consumer spending gained for the third quarter in a row, rising to 3.3%, its fastest pace in three years, slightly above the 30-year average of 3%. 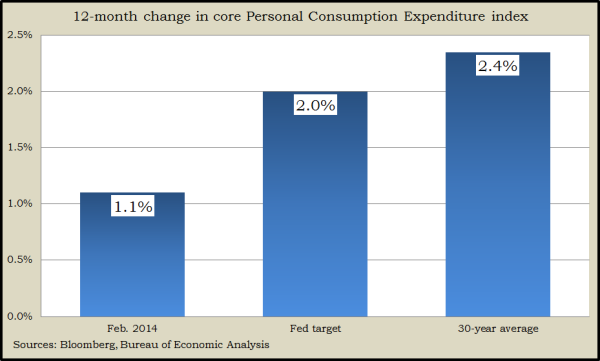 American consumers kept spending in February with money going out as fast as it was coming in. The Bureau of Economic Analysis said personal income and spending both rose 0.3% from January. Adjusted for inflation and taxes, disposable income increased at the highest rate in five months, often a sign that increased spending will follow. Spending rose more in February than it has in four months, led by spending on non-durable goods and on services such as utilities and health care. The Fed’s favorite measure of inflation remained at an annual rate of 1.1%, well below both the Fed’s target and the historical average.